The Hits of Chicago and More! Danny Seraphine co-founded the supergroup Chicago in 1967 and was their drummer/songwriter until 1990. In April, Danny was inducted with Chicago into the Rock & Roll Hall of Fame. 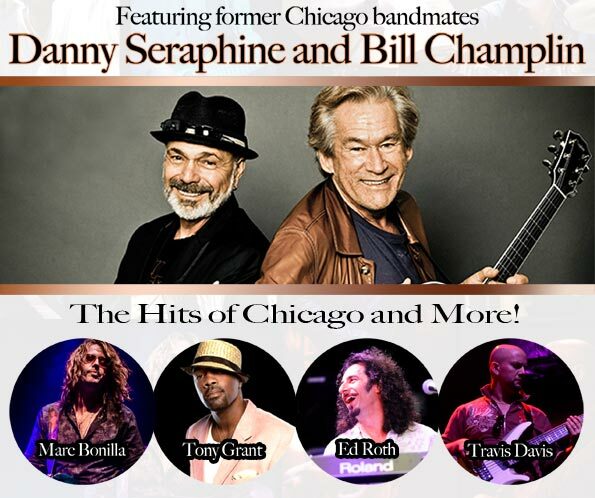 Grammy winner Bill Champlin also spent 28 years in Chicago, as a lead vocalist/keyboardist from 1981 until 2009. Chicago is one of most successful pop/rock acts of all time, selling more than 100 million records (second only to the Beach Boys in the number of Billboard single and album successes). Songs like "Hard Habit To Break," "Look Away," "Hard To Say I'm Sorry," "Saturday In The Park," "25 or 6 to 4," are just a few of their countless hits. Danny and Bill's joint contributions to Chicago are unmistakable, with over 50 years collectively invested in the music. Seraphine and Champlin have since reunited as CTA and are once again performing the hits that they helped establish as an integral part of pop culture, with a few new surprises along the way!